How Long to Keep Business Records for the CRA or IRS? The Number of Years Is Different in Canada and the U.S.
For tax purposes, you need to keep your income tax returns and other business records for six years in case the Canada Revenue Agency (CRA) decides to review your tax returns and/or audit your small business. (Don't Want a CRA Audit? Avoid These 10 Red Flags.) This includes records in paper or electronic form and should include all supporting documentation for income and claims for deductible expenses. For U.S. tax returns, "keep records for three years from the date you filed your original return or two years from the date you paid the tax, whichever is later, if you file a claim for credit or refund after you file your return. Keep records for seven years if you file a claim for a loss from worthless securities or bad debt deduction" (IRS). Actually, the Canada Revenue Agency (CRA) states that "if you file your return on time, keep your records for a minimum of six years after the end of the taxation year to which they relate" (emphasis added). However, the six years is from the end of the period for which the tax return was filed, so for a tax return filed in 2015 you must keep the records until December 31 of 2021 (one day less than seven years). Most businesses keep their records for seven years to avoid confusion. If your records are in electronic form they must be available in a format readable by the CRA. For additional information on electronic record keeping requirements see the CRA circular IC05-1R1 Electronic Record Keeping. The IRS can accept electronic accounting records from most popular accounting software programs and may request these in order to reduce printed paper and decrease the need for follow-up requests. What If I Am Appealing a Tax Judgement? For Canadian tax returns the CRA also cautions that if you have filed a tax objection or appeal, you should keep your records until the issue is settled, and until the time limit for filing any further appeal has expired (which may mean keeping records for a particular fiscal year longer than six years). The same applies when appealing a U.S. tax judgment - keep all records until the appeal process is complete. Note also that when appealing a tax judgement in addition to keeping copies of all paper correspondence you should also keep written records of every meeting or telephone conversation with tax officials, including the date, time, and the topic of conversation. Keeping thorough records will increase your odds of a successful appeal. Can I Get an Exception to the Six Year Rule? 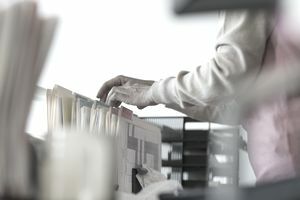 If you want to dispose of your business records in Canada before the six year minimum period is over, you need to get written permission from the director of your tax services office. The form to use for this is T137, Request For Destruction of Books and Records. The Canada Revenue Agency may or may not grant an exception. If you destroy your paper or electronic records prior to six years without permission from the CRA you may be subject to prosecution. Note that the CRA may also demand that some or all records be retained for an additional period of time. What If I Close My Business? If your business is not incorporated (e.g. it's a sole proprietorship or partnership) you must also retain your records for six years from the end of the last tax year. An incorporated business must retain records for two years from the date of dissolution of the corporation. What If My Records Are Lost, Stolen, or Destroyed (by Fire, Flooding, Etc.)? If you have claimed deductions but cannot produce the appropriate supporting documentation when requested by the CRA or IRS your claims are likely to be denied. If the records have been stolen or destroyed by an act of God, or if you can supply evidence of the theft or destruction, such as photographs of the damage, copies of police or fire reports, etc. the CRA/IRS may look upon your claims more favorably. However, when claiming deductions the burden of proof is on the taxpayer. It is your responsibility to take all reasonable measures to ensure that your paper/electronic books and records are safeguarded, whether kept on your own business premises or by a third party (such as an accountant or bookkeeper). Backup copies should be made and kept in safe storage or (for electronic documents) on backup media or on cloud storage. If you do not have backup copies you will need to make every effort to reconstruct your records by contacting banks, credit card companies, suppliers, etc. for copies of your records. You may also require the assistance of a tax lawyer to negotiate with the CRA or IRS.